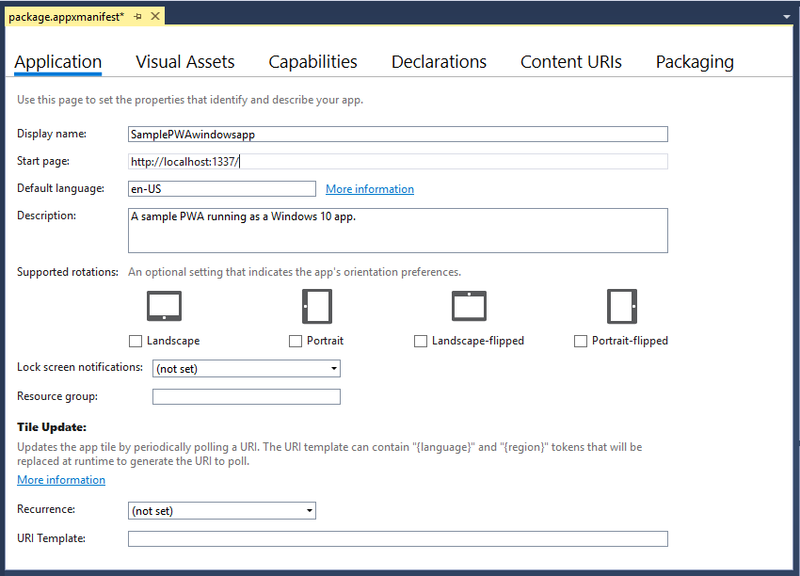 ...and these are only a few of the added possibilities for your PWA on Windows! This guide will show you how to install, run, and enhance your PWA as a Windows 10 app, while still ensuring cross-browser and cross-platform compatibility. An existing PWA (or hosted web app), either a live or localhost site. This guide will use the sample PWA from Get started with Progressive Web Apps. Let's set up our Windows app development environment in Visual Studio. Select the default Windows 10 Target version (most recent release) and Minimum version (build 10586 or higher) and click OK. Your new project will then load with the package.appxmanifest designer open. This is where you'll configure the details of your app, including package identity, package dependencies, required capabilities, visual elements, and extensibility points. This is an easily configurable, temporary version of the app package manifest used during app development. When you build your app project, Visual Studio generates an AppxManifest.xml file from this metadata, which will be used for installing and running your app. Whenever you update your package.appxmanifest file, be sure to rebuild the project so they are reflected in your AppxManifest.xml at runtime. In the manifest designer Application panel, enter the URL of your PWA as the Start page. You can also modify the Display name and Description as you like. Save this file (or another 512x512 image of your choosing) to your desktop. Then, in the manifest designer Visual Assets panel, click on the Source field ... button, select it as your source file, and click Generate. (Then click OK to overrite the default placeholder images). This will generate the basic visual assets for installing, running, launching, and distributing your app in the store. If you see any red ('X') errors indicating missing images, you can click on the ... buttons to manually select a file from the generated images. In the manifest designer Content URIs panel, replace http://example.com with the location of your PWA (such that Rule = include and WinRT Access = All). This grants your PWA permission to call native Windows Runtime (WinRT) APIs when running as a Windows 10 app, which we'll do a bit later. If your actual PWA doesn't require WinRT access, you can switch the WinRT Access value to None. Either way, be sure to sub out the default http://example.com string with the URI of your PWA, or your app won't properly load at runtime. Build (Ctrl+Shift+F5) and Run (F5) your PWA project. Your website should now launch in a standalone app window. Not only is it a hosted web app; it's running as a Progressive Web App installed on Windows 10! Because a PWA is simply a progressively enhanced hosted web app, you can debug your server-side code the same way you would any web app, using your usual IDE and workflow. The changes you deploy live will be reflected in your installed PWA the next time you launch it (no need to redeploy your Universal Windows app package). 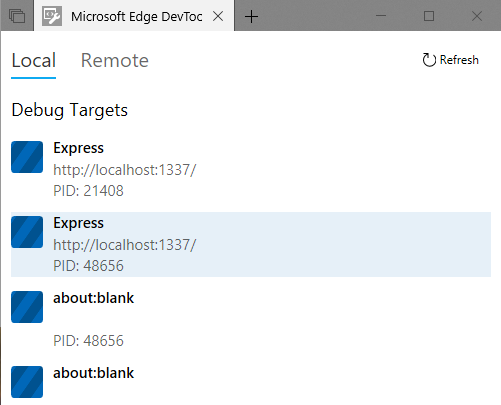 For client-side debugging within your Windows 10 app, you'll need the Microsoft Edge DevTools Preview app. This standalone app includes all the functionality of the original in-browser Microsoft Edge DevTools (including PWA tools), plus basic remote debugging support and a Debug Target chooser for attaching to any running instance of the EdgeHTML engine, including add-ins for Office, Cortana, app webviews, and of course, PWAs running on Windows. Here's how to set up debugging for your PWA. Install the Microsoft Edge DevTools Preview app from the Microsoft Store if you don't already have it. With your PWA site up and running, launch the DevTools app. Click on your PWA site listing to open a new DevTools instance tab and start debugging. This will return the global Windows Runtime object containing all the top-level WinRT namespaces. This is your PWA's entrypoint to the Universal Windows Platform, and only exposed to web apps that run as Windows 10 apps (running outside the browser, in a WWAHost.exe process). 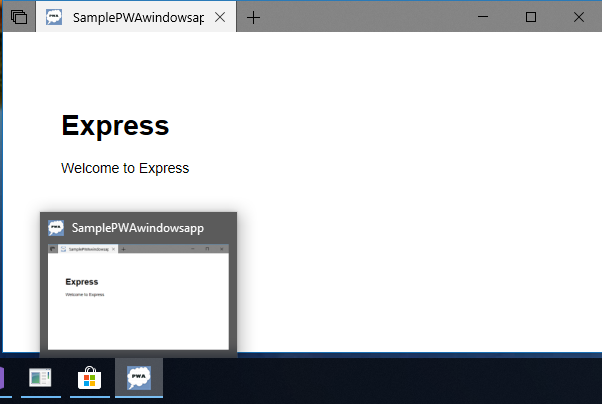 As an installed Windows app, your PWA has full access to native Windows Runtime APIs; its just a matter of identifying what you need to use, obtaining the requisite permissions, and employing feature detection to call that API on supported environments. Let's walk through this process to add a progressive enhancement for Windows desktop users of your PWA. There are a number of ways to identify the Universal Windows Platform APIs you need for your Windows PWA, including searching the comprehensive UWP docs on Windows Dev Center, downloading and running UWP code samples with Visual Studio, and browsing code snippets for common tasks for PWAs on Windows. At this point, let's pretend we want to add a custom context menu for Windows users of our PWA and have identified the APIs we need in the in the Windows.UI.Popups namespace. In order to call any WinRT APIs from our PWA, we'll first need to establish the requisite permissions (or, Application Content URI Rules) in your Windows app package manifest (.appxmanifest) file. If any of these API calls involve access to user resources like pictures or music, or to device features like the camera or microphone, we'll also need to add app capability declarations to the app package manifest in order for Windows to prompt the user for permission. If you later publish your PWA to the Microsoft Store, these required App permissions are also noted in your store listing. Through ACURs, otherwise known as a URL allow list, you are able to give the URLs of your PWA direct access to Windows Runtime APIs. At the Windows OS level, the right policy bounds will be set to allow code hosted on your web server to directly call platform APIs. You define these bounds in the app package manifest file when you specify your PWA's URLs as ApplicationContentUriRules. Your rules should include your app’s start page and any other pages you want included as app pages. If your user navigates to a URL that is not included in your rules, Windows will open the target URL in the Microsoft Edge browser rather than your standalone PWA window (WWAHost.exe process). You can also exclude specific URLs. none: Default. The specified URL has no platform access. In this tutorial, we've already set the only ACUR we need (Step 6 of the previous Set up and run your app section) for our "single-page app". 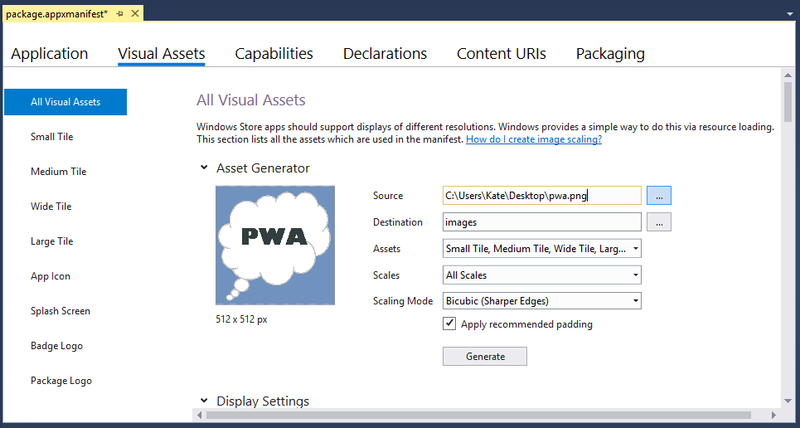 You can confirm this from the Content URIs panel of the Visual Studio package.appxmanifest designer. You can also view the raw XML of your manifest by right-clicking your package.appxmanifest file in Visual Studio Solution Explorer and selecting View Code (F7). To toggle back to the Designer view, select View Designer (Shift+F7). Special-use capabilities that support enterprise scenarios and require a Microsoft Store company account. For more info about company accounts, see Account types, locations, and fees. 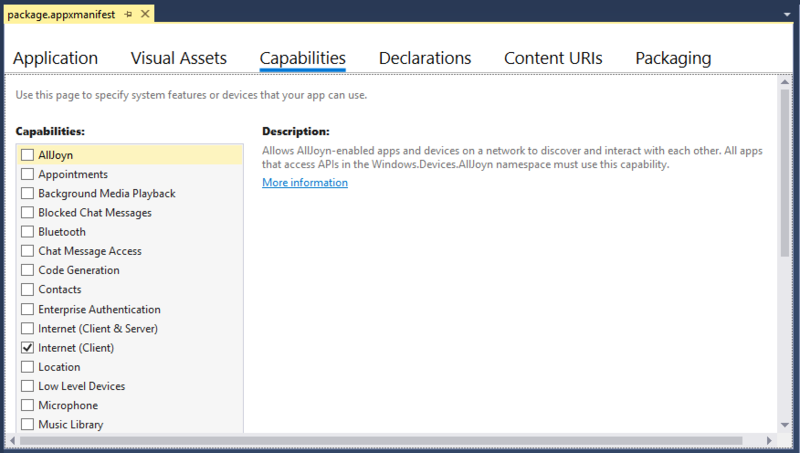 Your app's Microsoft Store page will list all the capabilities you declare in your app package manifest, so be sure to only specify the capabilities that your app actually uses. Some capabilities provide apps access to sensitive resources. These resources are considered sensitive because they can access the user’s personal data or cost the user money. Privacy settings, managed by the Windows 10 Settings app, let the user dynamically control access to sensitive resources. Thus, it’s important that your app doesn’t assume a sensitive resource is always available. For more info about accessing sensitive resources, see Guidelines for privacy-aware apps. You request access by declaring capabilities in your app’s package manifest. In Visual Studio, you can do this from the Capabilities panel of the package.appxmanifest designer. In this tutorial, we only require the default Internet (Client) capability, so no further action is needed. To ensure a quality baseline experience for our PWA audience across all platforms, we'll progressively enhance our PWA experience on Windows using WinRT feature detection. This way, we can be sure our Windows-specific code is only executed in a context where WinRT APIs are available and applicable. Open Visual Studio to your PWA site project. Compare the context menu behavior when you run your PWA in the browser (F5 from your PWA site project) versus from inside its Windows app window (F5 from your Universal Windows app project). In the browser, right-clicking gives you Microsoft Edge's default context menu, whereas in the WWAHost.exe process, your custom menu now appears. Hopefully you now have a solid foundation for progressively enhancing your PWAs on Windows. If you run into questions or anything is unclear, please drop us a comment! The Windows Dev Center is your complete reference for all stages of Windows app building, from getting started, to designing, developing, and publishing to the Microsoft Store. For a general overview on the Universal Windows Platform (UWP) and how to target different Windows 10 device families, see Intro to the Universal Windows Platform. And when you're ready, here's how (and why!) to Submit your PWA to the Microsoft Store.